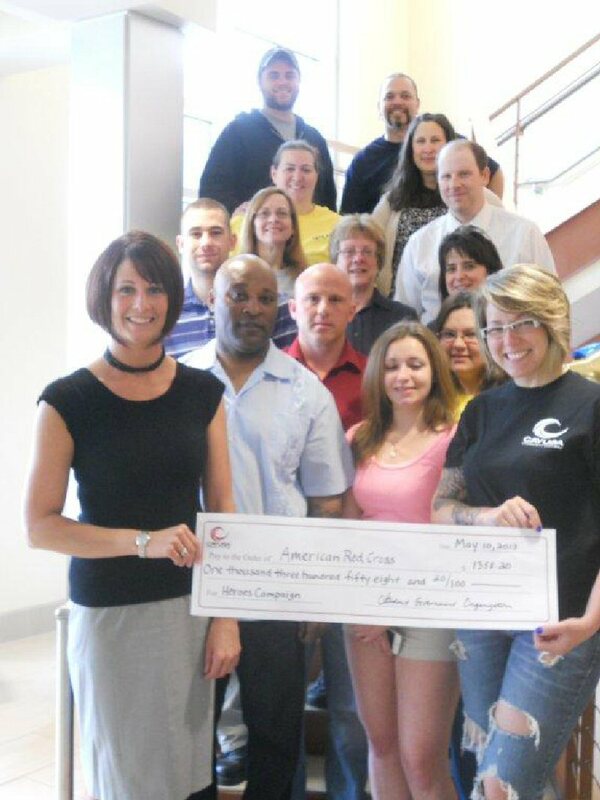 Pictured are (right front): Cayuga Community College Fulton Campus Student Government Organization President Kristan Marino ’13 presents a check to Danielle Hayden (left front), director of the Oswego Branch of the American Red Cross. Others in the photo are representatives from the participating clubs and their respective advisors. FULTON, NY – Cayuga Community College Fulton Campus students and advisors, participating in the Student Government Organization, the Business Leadership Club, Phi Theta Kappa Honor Society and the Veteran’s Club, recently presented a check presentation to Danielle Hayden, director of the Oswego Branch of the American Red Cross and coordinator of the Local Heroes for the American Red Cross campaign. Through various fundraisers, including bake sales and pizza sales, clubs raised more than $1,350 toward the campaign. Each year the ARC sponsors the campaign and charge for local business people, school groups and individuals who pledge to raise at least $1,000 for their local Red Cross chapter.